From the moment of birth, children are essentially like sponges, soaking up knowledge from the world around them. Although children are born learners, they do need the right environment in which to reach their full potential. A Toddler Program at a Montessori school provides this. During the toddler years, many children experience initial anxiety at the idea of being separated from their parents for any length of time. They need a calm and nurturing “home away from home.” At a Montessori school, toddlers are allowed to adjust at their own paces. They gradually learn to trust their teachers and feel comfortable with the classroom environment. Above all, young children know that they are loved and respected. The environment of a Montessori Toddler Program has other benefits for young children. The classroom encourages freedom of movement to facilitate choice and support physical coordination. It also lends itself to children’s natural desire for orderliness, which allows children to focus on their work. Unlike many traditional approaches to education, Montessori education is designed to meet a child’s developmental needs at every stage of his or her young life. 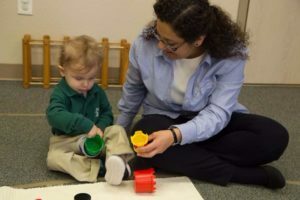 A Toddler Program at a Montessori school recognizes that this stage of life is characterized by the first steps toward independence, and the development of concentration and coordination. Montessori schools understand that toddlers are sensitive to language development, which means that toddler classrooms have limitless opportunities to explore language skills. Children who move on from a Toddler Program at a Montessori school have a firm grasp on academic fundamentals for the Primary Program. However, Montessori schools encompass much more than just academics. They focus on the whole child. A Toddler Program supports children’s social, emotional, physical, and cognitive needs. The Toddler Program at Starwood Montessori School is carefully designed to foster healthy development, help children feel secure in their surroundings, and provide them with a gentle transition to our Primary Program. Families who are interested in applying to our Montessori school in Frisco may reach us at (972) 712-8080. More information about the many benefits of Montessori education is available on our website.